When a panel gets to the point in a job interview where they ask if you have any questions for them, they’re probably not expecting something quite that blunt. But when I applied for the role of CharityComms director in February 2010, we only had 28 charity members and I wasn't entirely sure what the point of the organisation was. So I decided to listen. In my first fortnight, I spoke to the comms lead at each member charity and built a picture of what they wanted from our organisation. to connect comms people with each other and help them create their own network of support and inspiration. I'm quietly confident we've cut the sense of isolation for comms people across the sector by 86% (see above). Actually, although made-up statistics feel very ‘now’ in this post-truth world, we do have some genuine figures which demonstrate CharityComms’ impact. Those 28 organisational members have grown to 562 charities, with 369 individual members and 86 corporate partners, creating a network of over 4,000 people involved with CharityComms' membership. The trustees were right: there was a point to it. 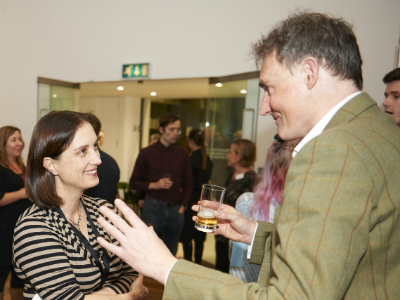 Meeting new people, catching up with old friends, sharing ideas, deepening knowledge, finding fresh insights and swapping stories – no one else can make this happen like CharityComms. Being a member of CharityComms makes me feel less alone in my role. It has helped me communicate better and, as a result, is increasing my charity’s impact. You can see some more nice comments straight from the horses' mouths here. So what have I learned in my six years? Communications matters to charities: we don’t communicate just to tell people about the change we’ve made in the world, we communicate to make change happen. Comms people in charities are hugely generous with their time, knowledge and support for their peers. Our popular mentoring scheme is just one example of this. At our events, I’m always impressed at how open and honest our speakers are about their successes and failures. Amidst all the pressures of low resources and high demand, creativity shines in our sector. There are a lot of inspiring people out there. Getting your digital communications right is vital, but nothing beats meeting face to face (although even comms people are too often guilty of burying their faces in their phones instead of talking to each other. Honestly – if you’re at an event, switch it off). If you listen to your audience’s needs and provide solutions that directly meet the challenges they’re facing, it’s not only deeply satisfying, but good business. A team which genuinely believes in and demonstrates the values of your charity is a beautiful thing to behold and creates a great place to work. Asking people to say nice things about you after they’ve had a couple of drinks at a party works surprisingly well. I’m sometimes cynical about specialised service providers to the third sector, but your organisation is tremendous value and a real force for good.